‘Half-happy, half-sad’ is how the Field-Marshal’s wife accounts for her character of Richard Strauss’s ‘comedy in music’, and if most productions keep audiences happy with an excess of sugar, then Robert Carsen’s new production for The Royal Opera redresses the balance without drenching Der Rosenkavalier in vinegar. In an ‘Insight’ evening (here) before the first night, Carsen and others stressed the light-hearted, carefree nature of the piece, that it should be genuinely funny. In the first two acts at least, there are few laughs to be heard or had, but all four main characters have created, with Carsen, wholly convincing characters with a plausible back-story which justifies the minute care taken by Strauss and Hugo von Hofmannsthal as they brought the story to the stage. Setting it uncontroversially at the time of composition, Carsen has alighted on a line in Act 1 and with an experienced director’s eye seen a new world in a grain of sand. His new bride, Ochs casually remarks to the Marschallin, is the daughter of a merchant honoured by the Emperor, no less, for supplying arms to the Austrian army. 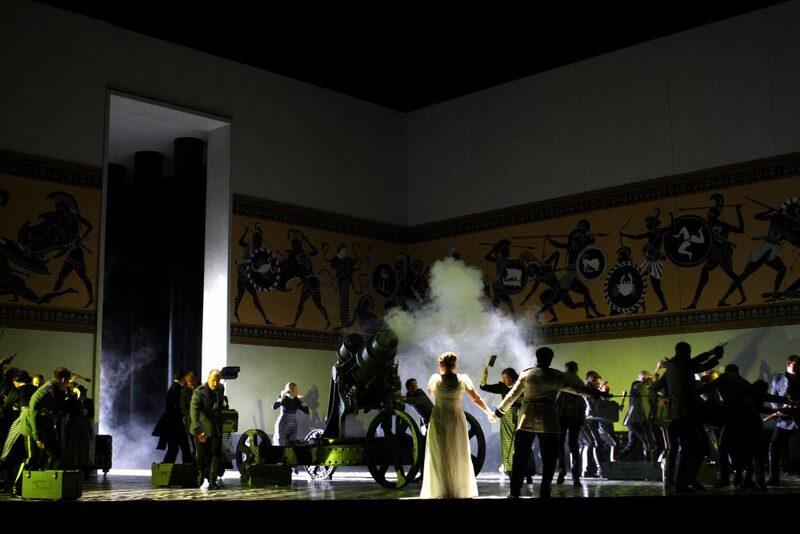 Thus Sophie bursts on the scene of Act 2 by leaping onto a Howitzer on show in her father’s palace with as much unconfined exuberance as Elisabeth making her entrance in Tannhäuser. She is by no means the convent schoolgirl turned nervous bride we (and the aristos around her) usually assume her to be, but rather the daughter of the city’s main arms dealer: this day is her payoff. Sung with tireless poise and sweetly tuned leaps by Sophie Bevan, hers is not a brief and shocking journey from innocence to experience but a slice of life quite distinct from the frustrated history of the Marschallin. Her final duet with Octavian is as fragile as a soap-bubble and perhaps as permanent. Poured into Brigitte Reiffenstuel’s costumes, Renée Fleming channels one of her illustrious predecessors, Maria Jeritza (though the Czech mezzo was renowned as Octavian rather than the Marschallin), and is sympathetically placed on the stage by Carsen to make much of what was never a large, hall-filling soprano but now depends for its effect on acute adjustments of vocal colour and demeanour. Ochs is so underplayed in the first act, and sung so straight by Matthew Rose, that a new character emerges from this bluff officer, continually trailed by his uniformed retinue, an updated Don Giovanni of careless rapaciousness, whose hymn to sexual assault in Act 1 is the more chilling for its offhand suavity. Even the Marschallin has to smile, though there is little of the boorish bumpkin about him, and he is all too believable to be a figure of fun. Accordingly his downfall plays out as a provisional setback: the final brittle exchange between Ochs and the Marschallin was one of several high-points in a psychologically rich staging with continual correspondences back and forth between turn-of-the-century Vienna and our own, hardly less neurasthenically challenged times. 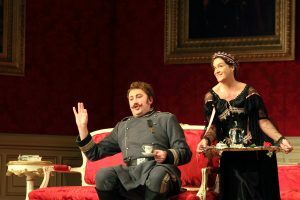 Which brings us to the rewarding intricacies of the opera’s central character, Octavian, as sung and played – really played – by Alice Coote. This Octavian relishes the chance to play dress-up in Act 1, flirts with Ochs as much as he with her and then shows his/her true colours in a brothel-scene Mariandel which deserved and prompted nervous giggles rather than the well-dined, third-act guffaws of an audience in on the act. Done up in full scarlet fig, it was impossible to know what Coote would do next, or how she would sound – perhaps kick off a Brecht/Weill number, or have done with her toying of Ochs and poison him? 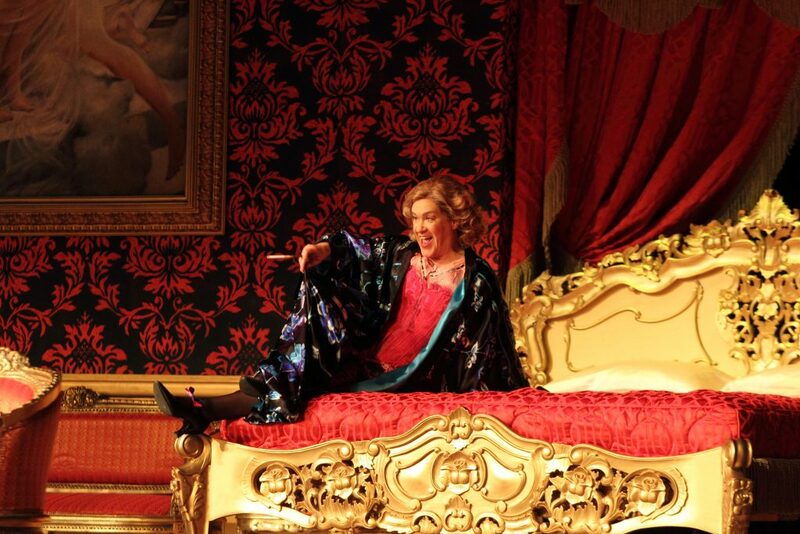 With a rather earnest Handel show Coote has explored operatic gender-bending before now, but her Octavian is an assumption worthy of Tilda Swinton, teasing stereotypes and stretching beyond limits of gender. The second cast brings a slightly different, inevitably less embedded slant to Carsen’s direction. Rachel Willis-Sorensen is a slightly fidgety stage creature possessed not of that aristocratic hauteur which makes Fleming the Marschallin of our age but of a nervous, even maternal vulnerability. She makes more of her words in a more evenly projected vocal range, to embody a character as much imprisoned by the trappings of her state as proud of them. One of the few ends left tantalisingly loose by Hofmannsthal is the question of whether the Field-Marshal’s marriage is childless, and Fleming and Willis-Sorensen give different, oblique, equally intriguing clues. Anna Stephany does well not to imitate Coote; her Octavian is assured and boyish without ever upending travesti conventions, and her upper range blends more harmoniously with her colleagues, culminating in a trio sung with full passion but lacking the last degree of meaning imparted by the first cast. In both cases Andris Nelsons in the pit reached out to accompany them with the utmost sympathy; his conducting is almost the single most impressive facet of the production. No sly musical or dramatic reference to Tristan und Isolde goes unnoticed in the opera’s opening scene; once it is banished, Nelsons gives full rein to the Expressionist aspects of the score’s harmony and orchestration in a way that he might not at the Vienna State Opera or the Met; he works with the orchestra before him, who respond with unflagging energy and a tonal sophistication that recalls the high-points of Bernard Haitink’s tenure as Music Director.